This was the first Economic Freedom of the World Network meeting held in the Arab world. 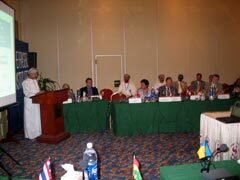 It was held from November 20 to 21, 2005, in Muscat, Oman and attracted delegates from across the Arab world as well as from Asia, Europe, Africa, and North, Central and South America. The meeting, which was co-hosted by The Fraser Institute, was a tremendous success. The discussions focused on case studies of countries on how they moved on the economic freedom front and what are the lessons/consequences from the process. The meeting had stimulating and thought-provoking presentations from Oman, Kenya, Mongolia, Costa Rica, Zambia, and Slovakia, to name a few. Special thanks must go to the team organizing the event, Sheikha Al Farsi and in particular we wish to acknowledge Salem Ben Nasser Al Ismaily, Executive President of OCIPED, for inviting the Network to Oman and for his continuing support of its work in the region. We would also like to thank the sponsors — The Omani Centre for Investment Promotion and Export Development (OCIPED), Bank Muscat, National Bank of Oman, Oman Arab Bank and Omantel– without whom this conference would not be possible. Conference participants gather for a group photo in the Omani sun.gather for a group photo in the Omani sun. HE Maqbool Ali Sultan, Minister of Commerce and Industry, Oman, giving welcoming remarks. 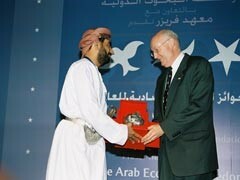 During the meeting in Muscat, the IRF hosted the first ever Economic Freedom of the Arab World Awards Ceremony. 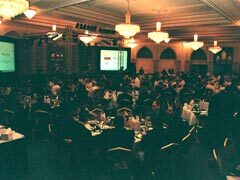 Over 300 people attended the Gala at the Al Bustan Palace Hotel. Oman and Lebanon tied for first place. Lebanon and Oman are the most economically free nations in the Arab world, according to the Economic Freedom of the Arab World, a new study released in Muscat, Oman by Canada’s Fraser Institute and the International Research Foundation (IRF) of Oman. Kuwait and the United Arab Emirates tied for third place. Economic freedom measures the extent to which individuals, families, businesses, and other organizations are free to make economic decisions without government interference. The Economic Freedom of the Arab World measures economic freedom in16 nations: Algeria, Bahrain, Egypt, Jordan, Kuwait, Lebanon, Libya, Mauritania, Morocco, Oman, Qatar, Saudi Arabia, Syria, Tunisia, the UAE, and Yemen. Nations are ranked in five areas: size of government; legal structure and security of property rights; access to sound money; freedom to trade internationally, and the regulation of credit, labour, and business. Four of the nations included in the report?Bahrain, Libya, Mauritania and Qatar?lack data for at least one of the above areas and are not included in the overall rankings, though rankings are provided in areas for which data are available. The Fraser Institute, along with its regional partner, IRF, produces the Economic Freedom of the Arab World, a new initiative to measure economic freedom and how free enterprise throughout the Arab world is lifting individuals and families out of poverty. The Economic Freedom of the World Network conference, a meeting of the network of international think tanks involved in the Economic Freedom of the World project, was held in Muscat from 20-21 November. 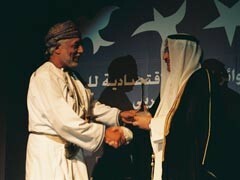 As part of that meeting, the IRF hosted an awards dinner to honour the top performers in each of the five sub-categories of economic freedom and the overall Arab Economic Freedom Award for the year 2005. National representatives from across the Arab world, business leaders, and representatives of the diplomatic community were in attendance. This category examines various measures to determine whether the government sector is inappropriately large, crowding out personal choice with government decisions. This area examines whether laws are fairly and transparently applied in a timely manner, and whether property rights and contracting are protected by the rule of law. This measures the extent to which a nation’s currency is sound and holds its value over time. This measures the extent to which businesses and individuals can freely trade with businesses and individuals in other nations. This measures the extent to which the regulatory burden hinders the formation or advancement of businesses, the free movement of labour, and ability to obtain or advance credit. Participants chat before the opening of the Awards ceremony. 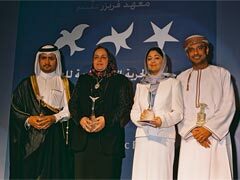 Representatives from Qatar, Lebanon and Oman, who shared the Sound Money Award, gather for a group photo. 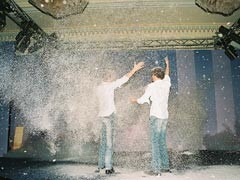 Two magicians from Germany, who entertained the crowed during dinner, perform their final act in which they brought snow to Muscat. Representatives from Kuwait accepts the Ease of Doing Business Award. Michael Walker, President, Fraser Institute Foundation and Senior Fellow at the Fraser Institute, receiving recognition at the Awards dinner for his contribution to the Economic Freedom Project. Prime Minister of Lebanon, Fouad Al Siniora made a point of personally picking up his nation's award after the Awards ceremony.